This is probably the recipe I’m asked for the most. It’s absolutely delicious and I don’t think I’ve ever made a different kind of chili. Hard-core carnivores love this too. I originally got this from Chris, Sister’s boyfriend, and I think he adapted it from a Moosewood cookbook. Chili is super adaptable, so taste as you go and adjust it to your preferences. I made this recently for an event that was being held at Seekers. The same event had been held in the fall and it was such a hit that the organizer for the event wanted to have it again despite the warm weather. Whether you make it now or save it for cooler weather, you’ll definitely want to keep this chili in mind! In a large skillet heat the olive oil over medium high heat. Once the oil is hot, saute the onion, garlic, zucchini, and bell pepper until tender. Add the spices and mix well. Stir in the “beef” crumbles and frozen corn. In a large stew pot, combine tomatoes and beans. Add in the sauteed and spiced vegetables. Stir to combine. Bring to a boil and then reduce to a simmer for about one hour to allow the flavors to meld. Adjust seasoning as needed. 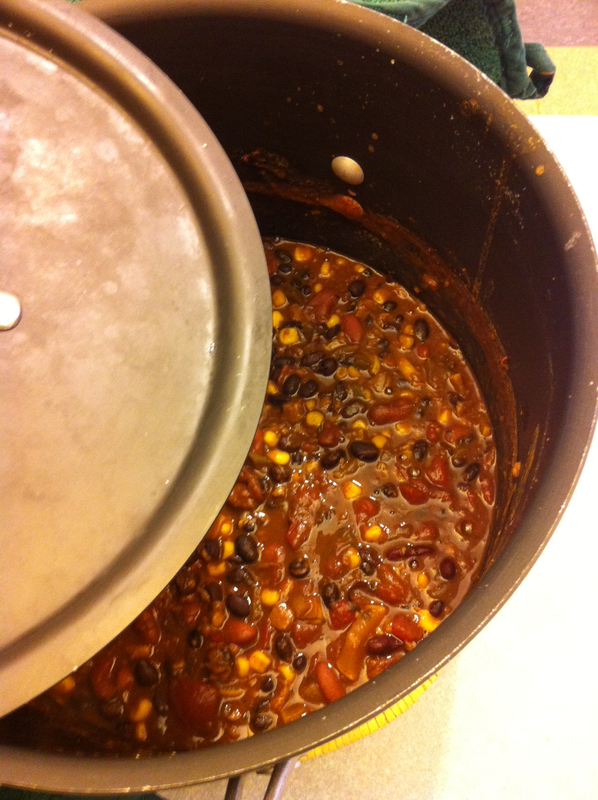 Pingback: 3rd Annual Chili Contest Round-Up & Winner!